LBHS Boys Baseball continued their undefeated league play on Tuesday, April 17. Visiting Saddleback, four LBHS pitchers combined for a no-hit, with a score of 27-0. The Breakers are now 13-8 on the season, 8-0 in league play. Grady Morgan led the offense with a Grand Slam homerun in the first. Michael Kerner, Christian Holm, Dylan Schreyer, Jared Angus and Morgan all had multiple hits on the day, and 12 different hitters contributed to the 17-hit attack. Jack Loechner, Joe Sweet, Cutter Clawson and Remy Mackel teamed up on the mound to no-hit Saddleback. LBHS Drumline definitely saved the best for last in the semi-final competition at King High School in Riverside recently. They came in third place in their Scholastic B division and gained first place in that music category. They also won third place overall, out of 46 schools, in the music category. Winter Percussion drumline is a competitive drumming ensemble that incorporates drill movements similar to marching band and uses both marching and concert percussion instruments to perform in a gymnasium. In essence, it is a percussion-only marching unit, with a blend of theatrical elements. Led by Rudi Moore and Emmanuel Mora, under the direction of Jeremy Chung, this is a very talented group of kids. Chung notes, “The students have the option to join Drumline as an extracurricular activity. We don’t turn students away as long as they are committed and can be at all the extra rehearsals. All Drumline students are also involved with other music classes at LBHS – wind ensemble, string ensemble, jazz band, etc. “The Drumline is part of the instrumental music program and competes in the American Drumline Association circuit. The competitive Drumline was formed eight years ago when I became the music director at LBHS,” he explains. Participating students rave about their experiences with Drumline, which may not have as high a profile as many student activities, but provides great enjoyment and valuable musical education for participants. Student Kendra Nugent had never played an instrument, much less read sheet music before she joined Drumline. Parents are also very impressed with the benefits of Drumline in improving their kids’ ability and enhancing their existing talent. Chris Davison, Sydney’s dad, notes, “Before my two kids joined the group, I had never heard of Drumline. Now I love to go to all their competitions and performances. It is fun to watch because there are so many elements: Music, costumes, choreography, stage props, and sometimes a little theater. Unfortunately the team can’t participate in the Drumline Finals competition; most of the students are also in the LBHS wind ensemble and they will be performing in a music festival in SFO the same weekend. Congratulations to the group for a high-profile season! LBHS Senior Isabel Riches has been selected to the Great Britain/England Water Polo Junior National Team, with whom she spent spring break training in the Netherlands. Isabel next represents the England team when she plays in the 2018 EU Nations Cup, May 24-27, in the Czech Republic. Isabel will also continue as a D1 Varsity water polo player next fall at Brown University. The 9th Annual Chef Challenge, generously hosted by Cary and Suzanne Redfearn of Lumberyard, once again served up a delicious culinary competition benefitting SchoolPower. 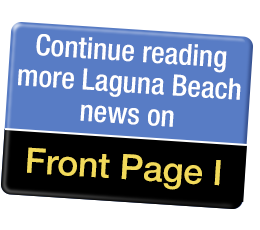 The event on March 26 featured Laguna school principals as dueling guest “chefs” competing with two different three-course meals. Diners voted on their favorite items and the coveted golden spatula trophy was awarded to the victorious team. This year’s challenge had Principals Duddy and Conlon squaring off with Principals Allemann and Salberg. With a robust turnout of 114 guests and $8,600 raised, Chef Challenge was a win for our public schools. To kick things off, the cocktail competition got heated with SchoolPower Endowment President Chris Clark mixing up his Paloma Borracha (Drunken Dove) and SchoolPower President Kristin Winter concocting her special Salty Russian. Although both received rave reviews, ultimately Chris Clark took away the title. While guests enjoyed the appetizers and main courses, team Allemann/Salberg worked the room to gain votes for their menu which included a delectable coconut curry crab ceviche appetizer. Team Duddy/Conlon vied for tallies on their side of the menu featuring a mouthwatering Bailey’s semifreddo dessert. For more information on SchoolPower, go to www.lbschoolpower.org. Three teams from Laguna Beach Unified School District that competed in the Destination Imagination® (DI) Affiliate (state/country) Tournament have advanced to the Global Finals taking place May 23 - 26 in Knoxville, Tennessee. Laguna Beach High School’s Brilliant Boom Bam Bananas competed in the Scientific Challenge, which asked teams to create an amusement park attractions using scientific concepts. The team created a four-foot fidget spinner that team member Joseph Hovanesian rode during the performance, all in an underwater setting. Team members also included Evan Henry, Jared Moy and Miles Riehle. The team placed third at the affiliate tournament, qualifying for global finals. Thurston Middle School will be represented by two teams at the global finals: the Thunder McKings and Catnip. The Thurston McKings placed third in the Technical Challenge qualifying for global finals. Their challenge was to design and build a device to navigate a maze. Team members Michael Berg, Theo Cofffey, Will Coffey, Odin Fores and George Saba’s performance showcased a radio-controlled maze-traveling racecar complete with grandstand, fans, and sportscasters. Catnip placed third in the Improvisational Challenge, also qualifying for finals. The team was asked to perform an improvisational skit about two explorers on a quest to find a missing cultural treasure. Team members May Chapman and Quinn Butler played explorers Queen Teuta and Howard Carter on a quest to find and returned Machu Picchu to its rightful owners, played by Ophelia Chapman and Ani Hovanesian. Team Destination Infiltration, who also represented Thurston Middle School at the State Tournament, received first place in their instant challenge score and may qualify for the Global competition. In the scientific category, team members James Dechary, Chris Herkins, Dylan Newburry and Tyler Palino, performed a creative story featuring a shrunken scientist being mistaken for a jellybean, eaten, and finding himself inside a body-themed theme park. The annual Global Finals competition is the world’s largest celebration of student creativity with more than 17,000 people in attendance each year. For more information see www.LagunaBeachDI.com. Top of the World Elementary School is a California Green Ribbon School and the recipient of a Green Achiever certificate from the California Department of Education, the highest achievement given to schools who have been nominated to compete on a national level for the US Department of Education Green Ribbon Schools (ED-GRS) recognition award. More than 30 public schools and school districts selected as California Green Ribbon Schools were recognized as part of the California School Recognition Program by State Superintendent of Public Instruction Tom Torlakson at an event hosted at Top of the World Elementary School on Monday. The event included an awards ceremony and presentations from Laguna Beach Unified School District staff showcasing the gardens, Waste Management recycling programs, energy efficient facilities, and more. “Top of the World Elementary has been providing robust and innovative education for students since its inception 50 years ago,” said LBUSD Superintendent of Schools Dr. Jason Viloria. “This recognition speaks to our commitment to developing environmentally and socially conscious students by providing opportunities for them to make positive impacts on the local and global community,” he continued. Over the last few years, Top of the World Elementary has been working to integrate sustainability practices with campus-wide campaigns including a coin drive that raised over $2,000 for a school in Kenya to purchase three dairy cows and a greenhouse; an ocean awareness club spreading knowledge about the dangers of littering the ocean waters that led to a fundraising of thousands of dollars to help clean up local waters and a partnership with Waste Management to improve the on-campus recycling program; a campaign to divert uneaten pre-packaged food items from the trash cans into a collection bin that is donated to the LB Friendship Shelter on a daily basis; a partnership with Schneider Electric to help implement energy conservation district-wide; and finally, one of the oldest school garden programs in all of OC with three on-site gardens totaling one-half acre, which are used as outdoor classroom spaces. The ED-GRS recognition award honors schools, school districts, and Institutes of Higher Education for excellence in resource efficiency, health and wellness, and environmental and sustainability education. The recognition award is part of a larger US Department of Education effort to identify and communicate practices that result in improved student engagement, academic achievement, graduation rates, and workforce preparedness; and reinforces federal efforts to increase energy independence and economic security. On Saturday, Laguna Beach High School Surf Team had a record day with the women’s shortboard team crowned team champion at the Scholastic Surf Series High School State Championships. The event was held at Oceanside South Jetty, and it was a nice day. The surf was a little tricky, but decent in the three to four foot surf range with light winds. Laguna Beach High School surfed in the team competition of the contest as all 14 High Schools were competing in the various divisions. Everyone worked really hard, with some doing double duty in two divisions. Our women’s team, as a whole, has been so strong the last couple of years in the various events with plenty of depth and consistency. Saturday’s team of Tess Booth, Kalohe Danbara and Kelly Smith worked really well together, each doing her part to take the team all the way to the end with the major win and really solid performances along the way. In the first round, the team was up against Half Moon Bay and they won 13-7. Next they surfed against Carlsbad with a 12-9 win. The semi-finals were a breakthrough performance for all three, and they easily defeated Edison 15-6. The women were on a roll and went into the final against Santa Barbara beaming with confidence and took another decisive win 14-7. MVP would have to go to Freshman Tess Booth, who was the iron woman, winning most of her five heats of the day. She not only competed well in the shortboard, but also put in a solid performance in longboard. Tess and her teammates, Maya Takayabashi and Destiny Thompson, competed well against La Costa Canyon, but did not advance, missing out 8-13. The men’s shortboard started the day first up against Coronado High School. Our guys surfed really hard and competed well with some outstanding performances and top finishes put in by the likes of Travis Booth, Sam Nelsen, Kiko Nelsen and Liam McCue. Meanwhile Joseph Schenk, Luke Hagopian, Ryan McGee, Luca Elghanaya and Lucas Jablon also gave their all. Unfortunately, the team narrowly missed out from advancement, losing by a meager one point at 32-33 points. In bodyboard, Travis Booth and Ryan McGee stepped up big time doing double duty, while ripping and having a good time along the way. They won their first round against Oceanside and narrowly lost to Dana Hills. Longboard also saw double duty and a solid effort put in by Sam Nelsen, who took a second place. Joseph Schenk and Luke Hagopian also surfed well, but unfortunately, were edged out by La Costa Canyon 9-12. The Boys & Girls Club of Laguna Beach proudly hosted its 10th annual Community Partner Breakfast on Tuesday, April 10 at [seven-degrees] in the Canyon. Board of Directors President Phyllis Phillips expressed the importance of partnership and collaborations and their vital role in helping the Club accomplish the organization’s mission to enable all young people to realize their full potential as healthy, caring and responsible adults. Pam Estes, Chief Executive Officer, delivered a poignant State of the Club speech where she addressed several Club initiatives the organization will be focusing on in the upcoming year. “We have some big goals that we see as meaningful ways to help more of the youth who need us in the community,” stated Pam. These projects include plans for a potential off-site teen center, additional inclusionary programming for the special needs population, gender equity for young females and Lake Forest expansion opportunities. The mayor of Aliso Viejo, David Harrington, received the Program Partner Award for AV’s investment of more than $300,000 since 2006 to ensure the city’s children have access to quality after school and summer programming at the Club. Massen Greene Foundation received the Agency Partner Award, as their organization has invested $95,000 over the last four years in support of the Club’s Eco-Smart program that teaches young people to be great stewards of the earth. Restaurant owner Gretchen Andrews of Starfish Laguna Beach received the Corporate Partner Award as she has contributed nine straight years of support towards the Club’s events including catering at Girls Night Out, toy drives and onsite fundraisers. Former Board President, now Emeritus member, Bob Whalen, received the Community Partner Award, as his family has championed the Club in numerous ways over the years, including being a strong advocate for all youth in the great city of Laguna Beach. Beau Bianchi took home this year’s Crevier Legacy Award, an honor given to a former Club member who has brought long-term impact on the organization as an outstanding role model for the community and embodies the philanthropic spirit the Club hopes all its members will someday achieve. Beau, along with his wife Brandee, have been a catalyst for bringing additional inclusionary and social skills programming for children with special needs at the Club. Their goal is to ensure that all kids can have a positive and safe place to go when they are not in school, while having additional support systems in place to achieve greater social agility with peers. The Boys & Girls Club of Laguna Beach’s Community Partners Breakfast began ten years ago by Emeritus BOD President Bob Whalen to recognize the partnerships built between the Club and the community leaders that help benefit the 2,000 youths the Club serves on an annual basis. For more information on the Boys & Girls Club of Laguna Beach including after school and summer camp programming, or about the annual breakfast, contact guest services at (949) 494-2535 or visit www.bgclagunabeach.org.